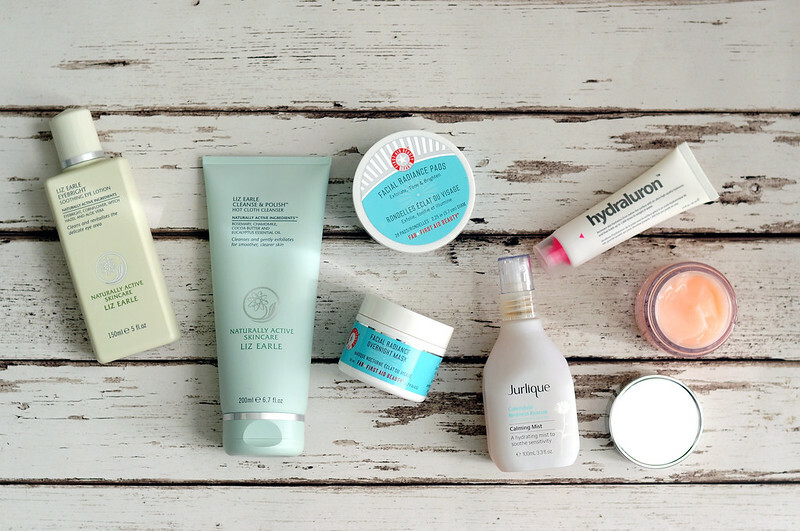 Liz Earle Eye Bright (£1.25) | Liz Earle Cleanse & Polish Hot Cloth Cleanser (£26) | First Aid Beauty Facial Radiance Overnight Mask (£28) | First Aid Beauty Facial Radiance Pads (£22) | Jurlique Calendula Calming Mist (£29) | Indeed Labs Hydraluron (£24.99) | Clinique Moisture Surge Extended Thirst Relief (£34). Does the average person have back ups of products their using so they're not without if a product runs out unexpectedly? Or is it just us beauty bloggers? I know I do and I probably have back up of back ups when it comes to certain products. I buy Liz Earle's Eye Bright in packs of three as it means I don't have to pay postage and also so I'm ever without. I do wait until I'm half way through the last bottle before making another order, but even then it means I have four bottles in my possession. It's not just skin care I do this with either. I always make sure I have a second mascara on hand in case the dreaded oh no this mascara has dried up and is unusable happens and I have nothing else to use. I also have what feels like a million and one shower gels to use before I even have to worry about buying another one. I used to love having a lot of beauty products when I first started this blog and read others, but now how I wish I only had a handful of products. I could actually go out and buy something new instead of buying another back up! Apart from Lush, I can't stop buying Lush, I'm putting myself on a no buy until I only have one back up of everything. Some it might not take too long as I think I only have two unused cleansers in my cupboard, but others like shampoo it'll take a while. Let's see how I get on! You really know when you love a product when you buy a back up! I have MUFE Smoky Lash mascara, Soap and Glory One Heck of a Blot and the Archery pencil. Ha, yes, I always have backups. Especially with things I take outside the house - like, there is no good reason for me to have five tubes of Body Shop Hemp Hand Cream or three Burt's Bees chapsticks, but... what if I lose one? !